The WannaCry ransomware attack that crippled hundreds of thousands of computer systems has made the threat of ransomware front-page news around the globe. This news should be especially daunting to small to midsize businesses as research shows that these businesses suffer from a greater frequency of successful ransomware attacks than larger organizations. With the stakes – and costs – of a ransomware attack higher than ever, what can small to midsize businesses do to protect themselves? 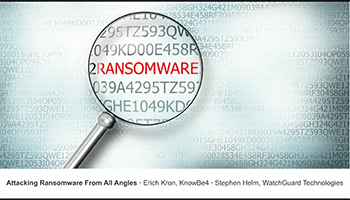 Join WatchGuard and security-training experts KnowBe4 for an in-depth look at the best tactics for ransomware defense.